Banned Books Week has Begun! 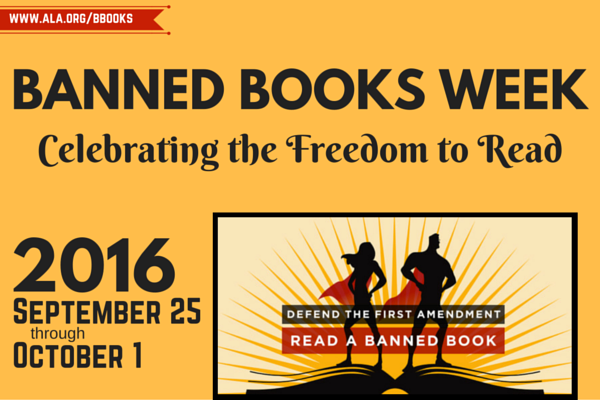 Welcome to the Tyler libraries celebration of Banned Books Week 2016! This week, the Library Space blog will feature posts highlighting the importance of initiatives like Banned Books Weeks and fighting censorship in our public libraries, school, and institutions! To start the week, let’s talk a little about the background of Banned Books Week. It started over 30 years ago with Judith Krug, a first amendment and library activist. Ms. Krug contacted the American Library Association’s committee on Intellectual Freedom about the banning of books in public institutions. Shortly after contacting ALA, Banned Books Week was formed and libraries have been championing this cause since. Banned Books Week is sponsored by the American Library Association (ALA). ALA supports and advocates for all library issues and topics, but one of the main tenets of ALA Library Bill of Rights (2016) is, “libraries should challenge censorship in the fulfillment of their responsibility to provide information and enlightenment.” To uphold this idea and policy, ALA does not advocate for the censorship of any materials found in school, public, academic, or any other type of library, instead they celebrate and promote the books that are challenged or banned in many areas. Tomorrow’s post will feature the most commonly banned works available at your Tyler Libraries! Happy reading!